Joyeux Réveillon du Nouvel An! / Happy New Year’s Eve! More pics, Review & Credits after the jump! 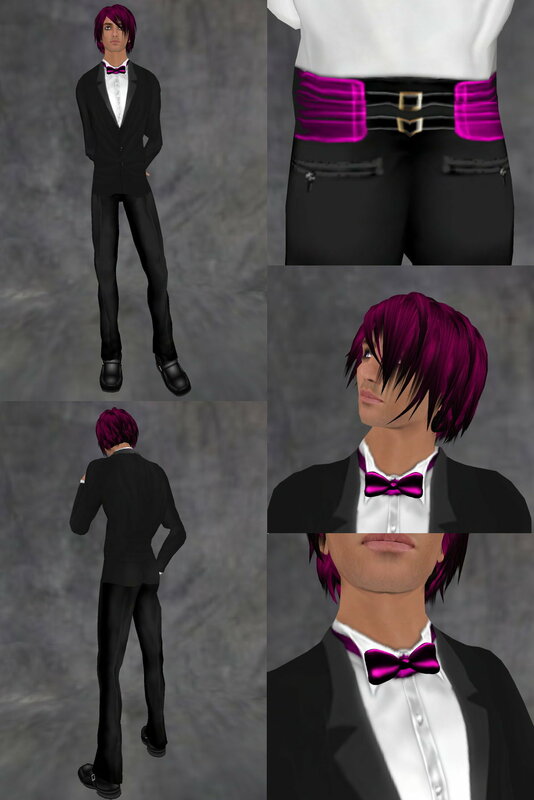 I’m showing here one of the new tuxedos from Styles of edo. The 2008 Tuxedo2, Coordinated04 comes with a black tuxedo jacket nicely accented in white at the lapel (on the jacket layer), jacket with black vest (also on the jacket layer), black vest on the jacket layer, black pants, and a wing collar white shirt with silver tie. 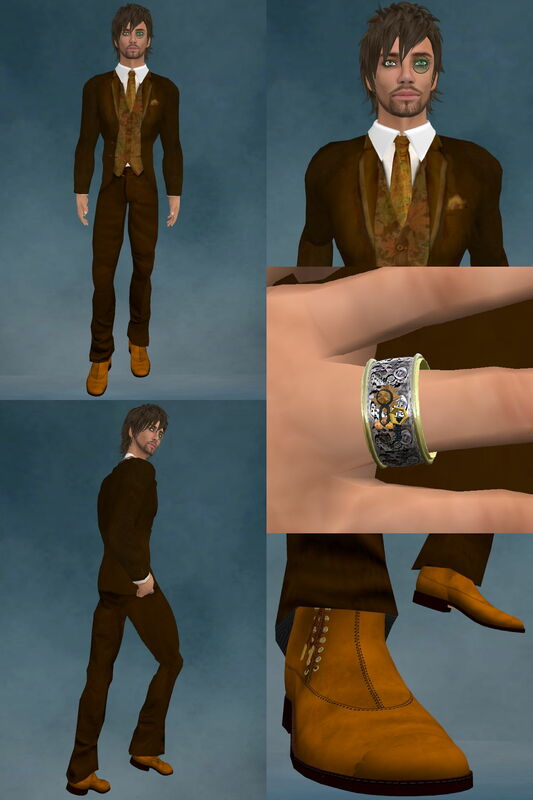 Everything is moddable, copyable, and no transfer, and the set sells for 700 Lindens. 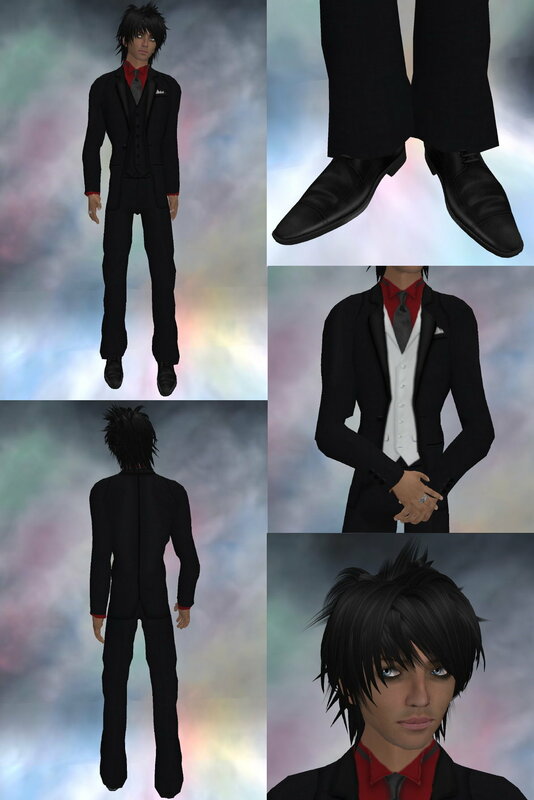 edo’s tux sets kind of make my head spin; he puts so many combinations together that I get lost in all the choices. 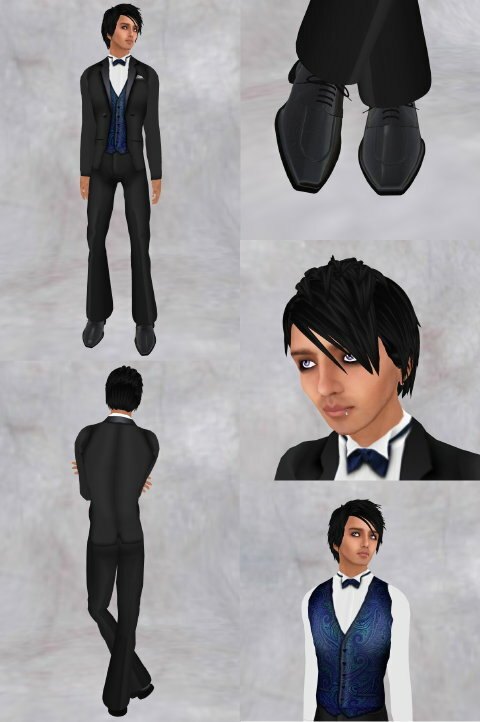 I’ve shown a few combinations of other jackets from two other new tux sets, as well as several options from the wingshirts fat pack, which includes 21 different shirt color/tie type & color combinations for 1600 Lindens, including red, blue, purples, yellows, white shirts combined with bowties, cross ties, and conventional ties of assorted colors. I prefer this to flexi ties which never look right to me. Deep black texture with subtle highlights, good seams and nice detail in these tuxes. Sometimes the colors in the shirts seem a little oversaturated (particularly the dark purple and dark yellow), making the highlights unnoticeable. The Solid Wave hair from Find Ash, shown here in Neo Black, is a fun style, but I’m not happy with the sparseness of the prims in the back which, when combined with the flexiness, causes bald spots to show through. Makes this hair a decent one for a photo shoot, but not sure I would wear it out and about SL much, which is too bad because I really like the style. Finishing off the look, I’ve chosen the Gallop shoes from Kalnins, in black and the Kavi Poet ring from Mhaijik Guillaume. Credits and more pics after the jump! This 2 button tux from Simone is well designed, available in a bunch of colors, and full of details that add to the overall realism. The cummerbund is especially nice, with a nice shirred effect. The sculpty bow tie is a little simple, but it does work, and is easily adjustable (unlike some sculpty attachments…). Sells for 450L, comes in sapphire, emerald, onyx, gold, fuchsia, ruby, amethyst, and teal. You can also buy the pack of formal bowties, in all these colors, plus white, for 250L. As usual with Simone! outfits, lots of layer combinations allow you to mix and match. Brava, Simone! I matched the magenta Kensei hair from Truth with the Fuchsia tux (this amazing “dollarbie” is available for 1L, in a fatpack of 72 colors…incredible). In the rest of the pics, I am wearing the dark choco color of Kensei. 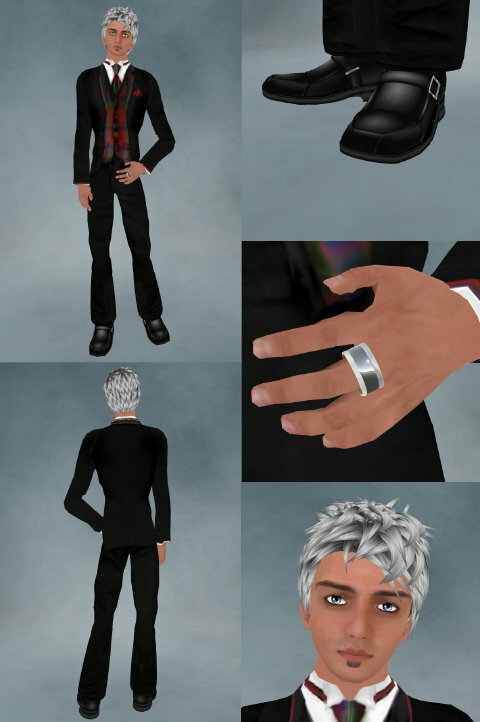 Finishing off the outfit…the City Walk shoes in black from Shiny Things, arguably one of the better pairs of dress shoes in SL, and the Ratri Night Dark Ring from Mhaijik Guillaume. More pictures and full credits after the jump!